With advancements in aircraft technology combined with ongoing industry efforts to standardize safety programs, private aviation at large – and air charter in particular – has never been safer. Alante believes that your safety, and that of each member of our team, is paramount and never to be compromised. The cornerstone of this promise is our embracing of the IS-BAO standard for safe company operations, founded on the implementation of an International Civil Aviation Organization (ICAO)-approved Safety Management System (SMS). SMS is a systematic approach to identifying, acknowledging, understanding, and managing risk in every facet of company operations, by every person within it – from the flight-deck to the president’s office. As opposed to simply being a tool to improve flight safety, SMS becomes an inherent part of routine organizational decision-making, business planning, and operations benchmarking, with the net result of improving safety in ALL actions within the company. This methodology is so effective, it is rapidly becoming industry-standard, and a mandatory component of third-party safety audits by IS-BAO, ARG/US, and Wyvern. Flight Crews are the foundation of the SMS, and often its most visible component. Thus, our crews are chosen on their training and performance histories, specific operational experiences, and demonstrated attitudes toward safety, regulatory compliance and service, rather than over-emphasizing subjective markers such as total flight time. Alante crewmembers then undergo extensive internal training on company policies and procedures, safety, first aid, hazardous materials, FAA regulations, aircraft operations, and service. Aircraft-specific simulator training at industry-leading providers such as FlightSafety International™ and CAE Simuflight™, follows to ensure crews are practiced in handling abnormal situations effectively. These events recur annually, and are supported by aircraft-based proficiency training and checking every six months, ensuring they are well prepared for each flight. Operations Control is a key safety facilitator, providing active, fleet-wide oversight of aircraft, aircrew, and environmental conditions to ensure both normal and abnormal operations fall well within the safety parameters set by the SMS, and that your experience in any situation is inline with Alante’s exemplary service standards. Senior Operations Staff, including the Directors of Operations, Safety, and Maintenance, as well as the Chief and Base Lead Pilots, oversee these activities and analyze collected flight operations data to identify areas to improve operational safety and consistency. This means you can expect a string of actions to unfold prior to, during, and following each of your flights, where all aspects of the airport, aircraft, environment, and crew are scrutinized to ensure a safe operation. Within 24 hours prior to departure, the Aircraft’s Crew reviews these and other operational factors in detail utilizing a pre-dispatch toolkit, sharing the results with senior flight operations staff for input prior to dispatch. Throughout your flight, your Captain monitors conditions along the flight path to ensure ongoing operation within planned margins. Further, OpsControl staff monitor progress in real-time, coordinating with your Captain and senior Flight Operations staff as necessary to identify and manage risks, often by simply adjusting departure or arrival times, airports, routes, or equipment. Completed trips are reviewed for operational safety and efficiency, particularly when the margin of safety was reduced for any reason. The data is then used to improve the SMS with new systems, procedures, training, and other risk-management activities in a continuous-improvement loop. 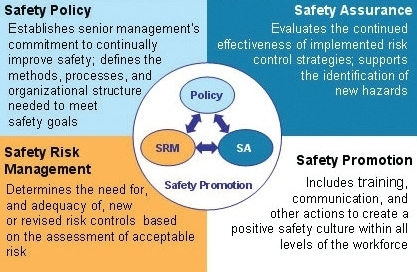 Ultimately, this defined safety strategy provides both a framework for conducting safe operations that moves beyond individual ‘perceptions’ of safety, and the metrics by which to judge compliance with that framework. Together, these lead to a continuous improvement loop with meaningful effect on risk mitigation – a tenet of Alante flight operations.